We take sedation VERY seriously at our office. The team at Dr Dina Pediatric Dentistry Clinic had extensive training in sedation and anesthesia. They completed anesthesia rotations as part of their Pediatric dental training, had to perform multiple sedations and have completed their Pediatric Advanced Life Support (PALS). These certifications are all maintained and updated continually so we can be comfortable that your child will be safe in our care. There are many types of sedation available to our patients and each is appropriate for certain types of treatment and certain types of behavior. This is commonly known as “laughing gas” and is widely used in pediatric dental offices with children receiving dental care to help decrease anxiety. It is a blend of two gases— nitrous oxide and oxygen–and is safely delivered via a nasal mask. It is safe, has a rapid onset, and is quickly eliminated from the body after a short period of breathing oxygen. The nitrous oxide acts to change the nitrogen levels in the body and creates a slight “happy” feeling in children; it does not put your child to sleep. 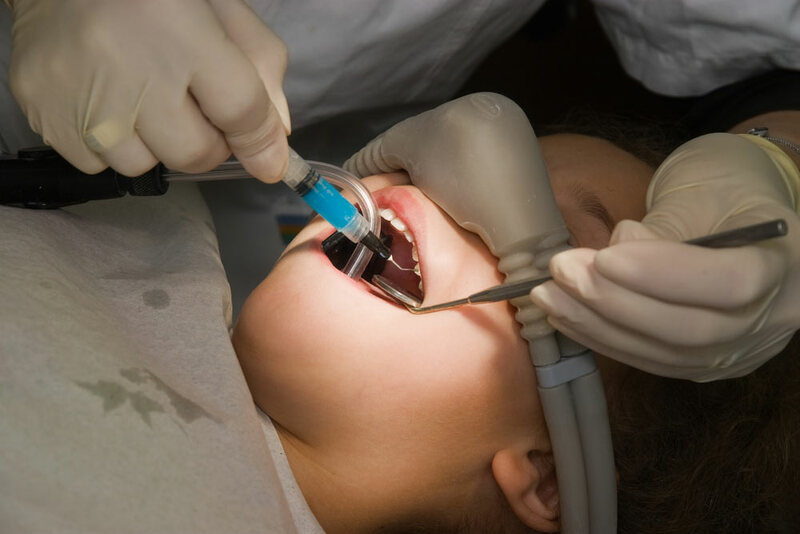 Due to the complexity of treatment and the age of the children, we sometimes recommend a liquid sedative for some children when nitrous oxide cannot adequately relax a child enough to cooperate with necessary dental treatment. There are several types of oral sedation that we use based on your child’s needs and anxiety. We normally use Midazolam (it has different commercial names) as recommended by the American academy of Pediatric Dentistry (www.aapd.org). Your child will always be evaluated prior to their sedation to evaluate their airway and their breathing. If your child is sick, or sounds congested we will reschedule their sedation, your child’s safety is our greatest concern. General anesthesia may be recommended for children with extensive dental needs, certain medical conditions and special needs, and for some children who cannot cooperate in the office while awake because of age, maturity level and complexity of the treatment. With this technique, children are asleep and all dental work is completed at one time under the supervision of an anesthesiologist.